Start Your Own Reseller Business with DirectAdmin! The DirectAdmin control panel has a truly unique feature for managing resellers. The reseller center is so easy to understand and navigate, it won’t take any longer than a few moments for a reseller to be up and running. Being able to manage IP space, DNS, themes, and many other features has made DirectAdmin a leader in reseller and hosting services. This control panel gives a reseller or hosting provider the ability to customize every aspect or create packages to make it easier and more efficient to create accounts with a specific number of features. There is a special menu for administrators, resellers, and users, so you will be able to easily navigate the site until you find what you need after you purchase a DirectAdmin license. With a DirectAdmin license, you can start earning an additional revenue stream by offering your clients the ability to become resellers and sell their services into the DirectAdmin hosting segment. Creating more revenue streams is one of the best ways to keep your company in business, even during a tough economy. 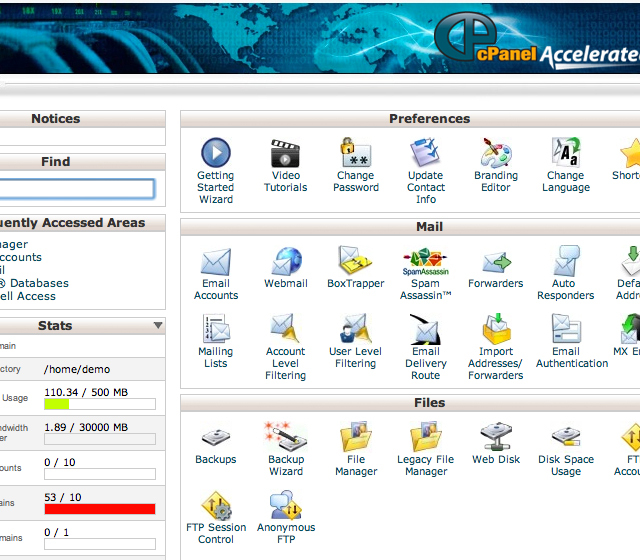 DirectAdmin will also allow you to automate your hosting with WHMCS or ClientExec. Automating your entire hosting operation should be a straightforward process with a DirectAdmin license. If you are a reseller, you need to find a control panel that supports IP addresses and full DNS management techniques. DNS has proven to be one successful way to keep your networks secure, and with a hosting plan, it is especially important to ensure that your customers will have a reliable website provider to work with. If you are a reseller, the same general rules apply. A reseller can greatly benefit from a DirectAdmin license because the software is optimized to make management and organization of accounts simple. 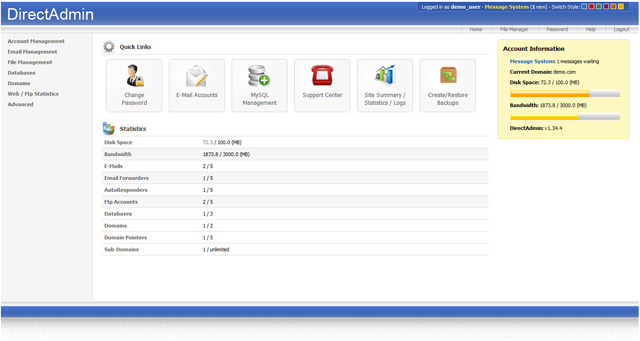 You can also create accounts quickly and migrate data easily. With IP and DNS support on your DirectAdmin license, you can take full advantage of the hosting capabilities of one of the most affordable control panel programs on the market. You are now able to manage your entire DirectAdmin server by simply reviewing three screens within DirectAdmin. 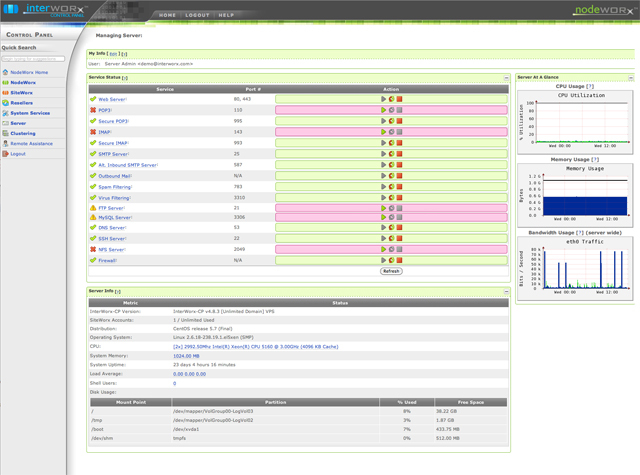 The “Process Monitor,” “Log Viewer,” and “System Information” sections provide you with full insight and information on your current server status and other system information. Using those three, you will be able to see exactly what is happening within the server and be able to easily stop and start any service before they become available or otherwise. Using this type of service will provide you with the valuable knowledge that you need to keep your server functioning properly at all times. When you purchase a DirectAdmin license, you will be able to utilize unique and powerful features on a control panel used by people all around the world. DirectAdmin makes things extremely easy. You will not only be able to save on staffing resources with DirectAdmin, but you will also be able to reduce your operating costs in general, as DirectAdmin is extremely cost-effectively priced. DirectAdmin may not seem to have all of the bells and whistles that the other products do, but it is extremely efficient, fast, and it provides you with all of the necessary features that you need to fully operate and manage your websites, servers, and networks with a control panel. DirectAdmin is probably one of the least expensive control panel software programs on the market, but that is not to say that DirectAdmin is cheaply made. 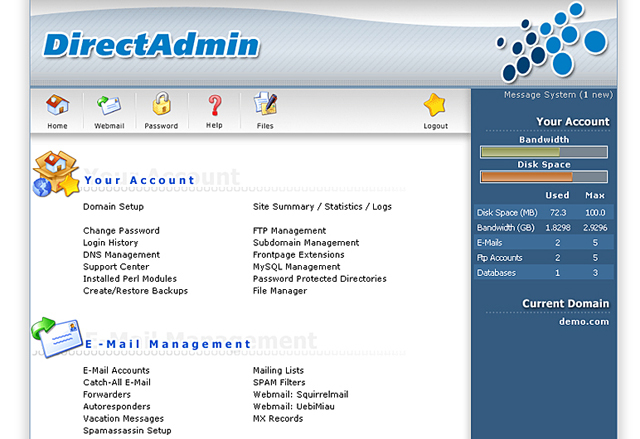 Many people think that DirectAdmin is undervalued because it is so easy to understand and to use. It provides even novice users with a quick and simple format that they can quickly apply to their system. With a DirectAdmin license, you will be able to manage your system with ease, keep all of your customer information up to date, and make sure that the experience that your customers have with your business is a pleasant one.